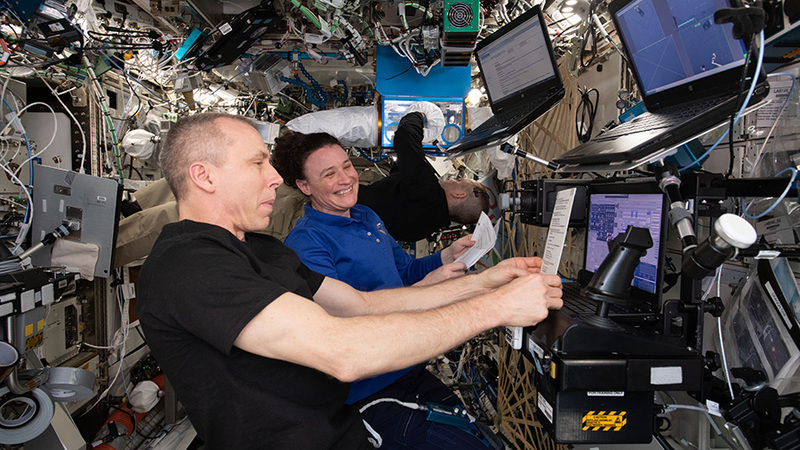 Astronauts Drew Feustel and Serena Auñón-Chancellor train on a computer in the U.S. Destiny laboratory practicing rendezvous procedures and robotics maneuvers ahead of the arrival of Japan’s HTV-7 resupply ship. Two new Expedition 57 crew members are getting ready for their mission at the Gagarin Cosmonaut Training Center in Moscow. Alexey Ovchinin from Roscosmos and Nick Hague from NASA are in Russia for qualification exams ahead of their launch and six-hour ride aboard the Soyuz MS-10 crew ship to the station on Oct. 11. That should be “Hague”, not “Nague”. I wish to use this opportunity to ask for explanation how the crew to deliver the supplies to the ISS. With the unprecedented speed the ISS moves is there possibility the ISS would be stationary for sometime to enable the crew deliver the supplies in space? A docking spacecraft moves relative to the International Space Station. Both spacecraft are orbiting Earth at approximately 17,500 miles per hour. The station will turn off its engines and go into free drift mode allowing a spacecraft to safely approach, rendezvous and dock.